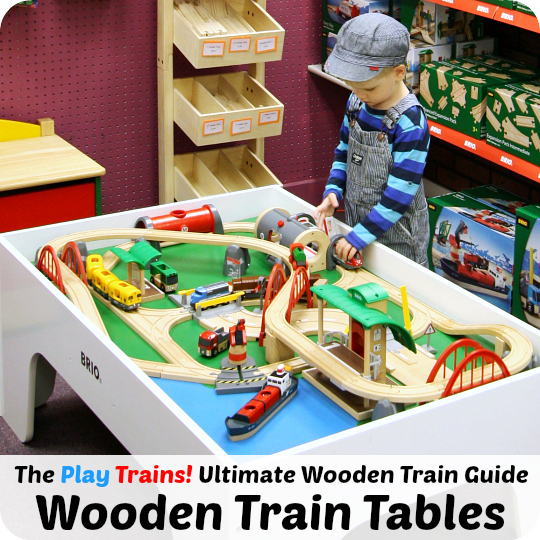 Early on, the Little Engineer developed an interest in designing his own wooden trains. 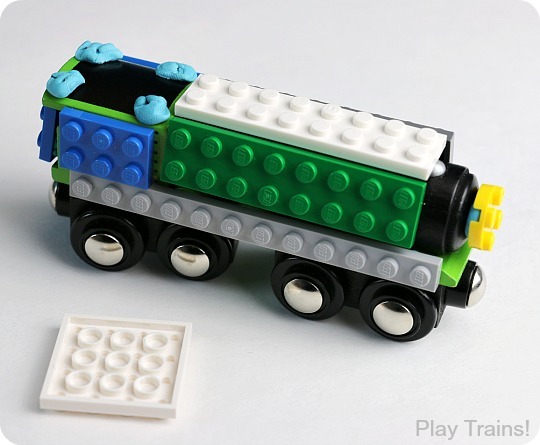 I’ve often wished that LEGO made a train that was compatible with wooden train tracks, but could be customized with any LEGO bricks he wanted to use. 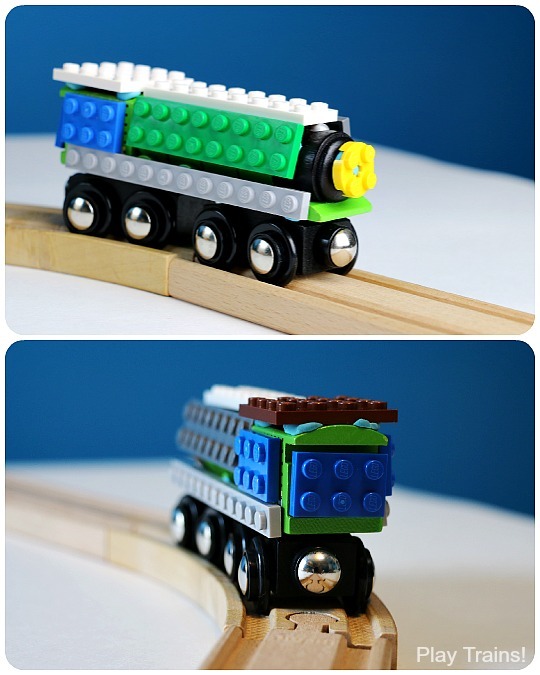 The answer was to make our own LEGO wooden train hybrid! 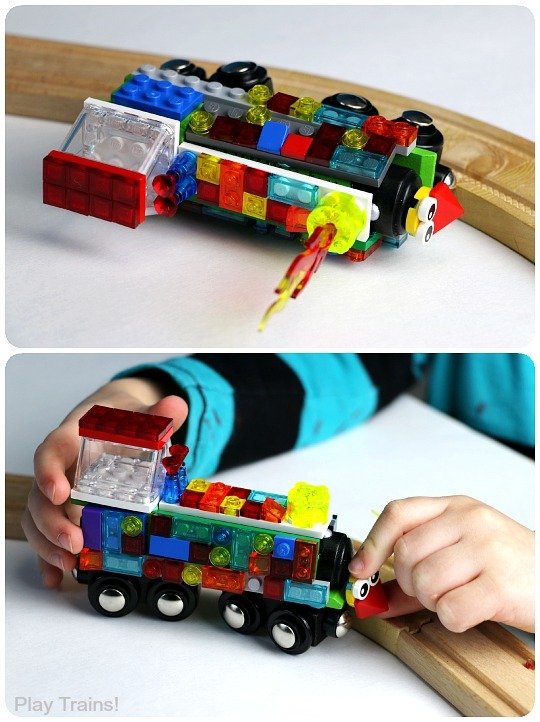 By temporarily attaching flat LEGO bricks to the outside of wooden trains in a way that won’t damage them, this makes for a really fun design project for any kid who loves trains. 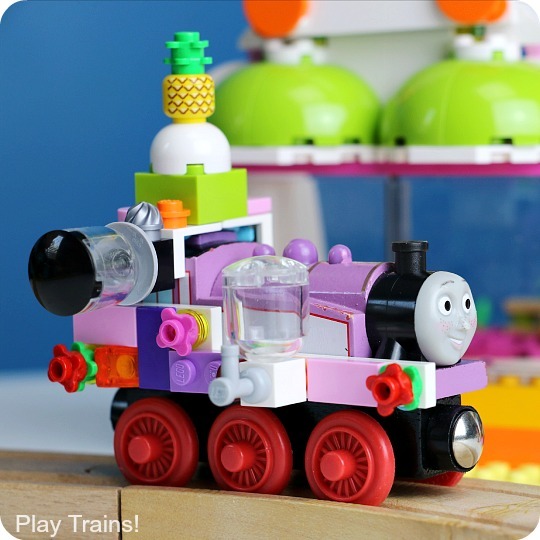 But it’s especially great for children who are into LEGO now but still love their old favorite trains, or for older and younger siblings to play together. This post contains links to Amazon.com and Lego.com. If you click on one, we will receive a small commission — at no additional cost to you — on anything you buy at Amazon or Lego for a certain length of time afterwards. Read our disclosure policy for more details. 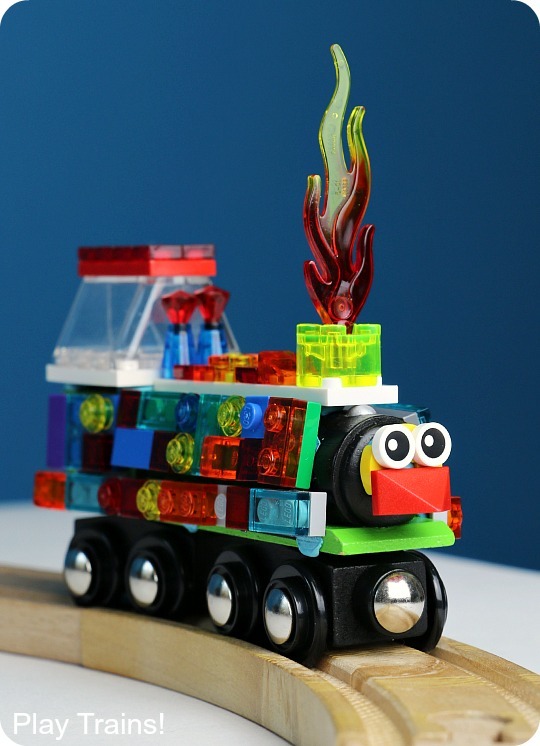 I’ll share some of the crazy cool custom wooden trains the Little Engineer and I made like the one below, but first I’ll demonstrate how to cover the engine to make it a base for further creativity. 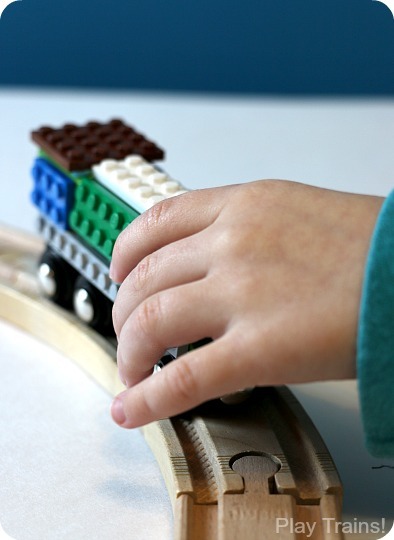 Earlier this week, I demonstrated how to attach LEGO bricks to wooden trains for LEGO minifigures to hold onto. 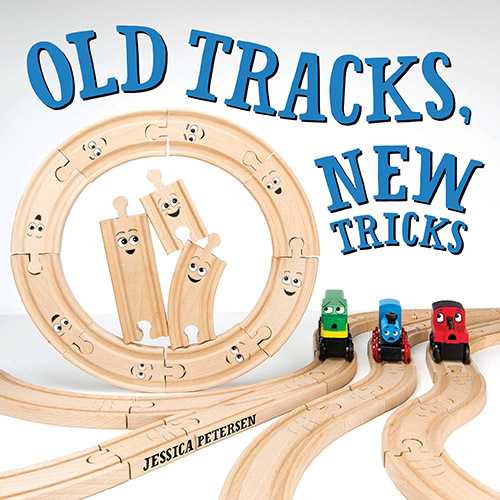 Once we’d done that, it didn’t take long for us to cover an entire wooden train. The great thing is that because we use poster putty/poster tack, the conversion is completely temporary. 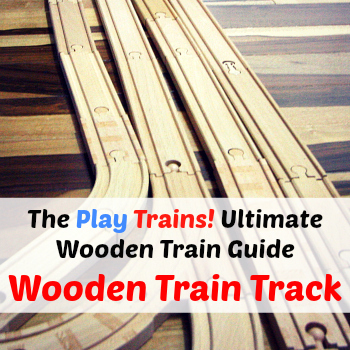 In our experience, the poster putty doesn’t harm the wooden trains at all. 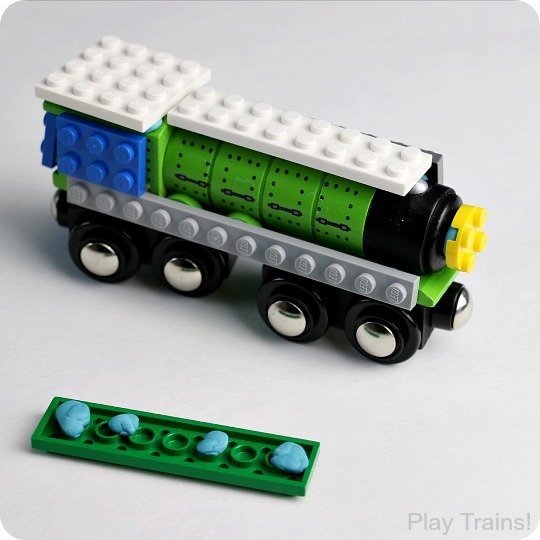 Using small balls of the poster putty, attach LEGO bricks to the outside of the wooden trains you want to customize. 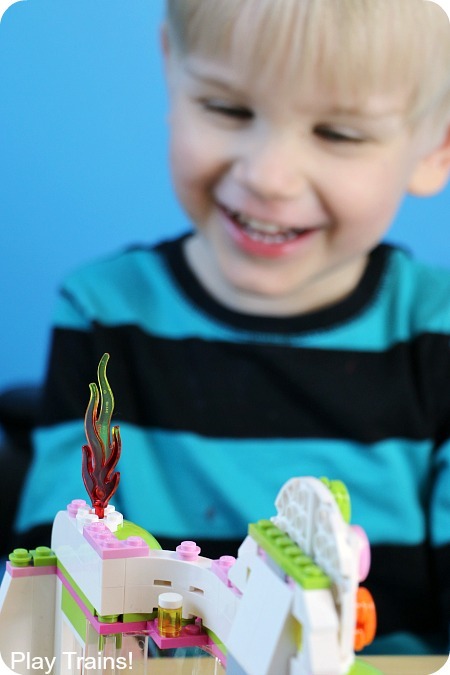 Flat LEGO bricks work the best, but feel free to get creative with whatever you have in your child’s LEGO collection. 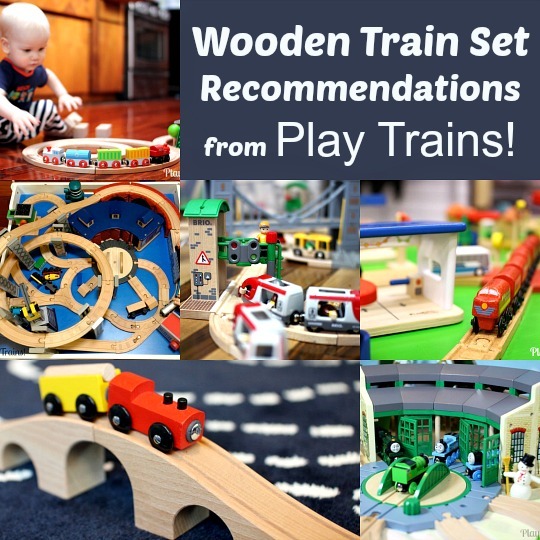 And of course, you can use any wooden train engine or car you like. Just remember, this is not an activity for children who may still put toys (or poster putty) in their mouths. In addition to the choking danger, the little LEGO bricks were too difficult for the Little Engineer to build with himself until he started getting the hang of them at the age of three-and-a-half. 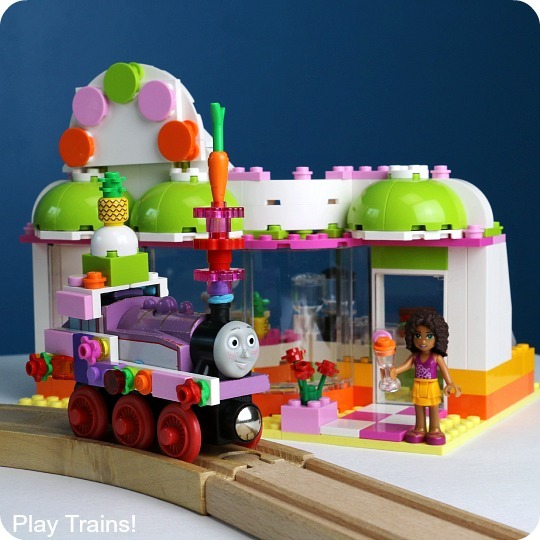 For toddlers and younger preschoolers who’d like to design their own trains, I’d recommend building and painting a wooden train craft kit together, or making trains with this DIY play dough train set with DUPLO blocks. For long, thin LEGO plates, I found that a single line of lumps of the poster putty down the middle worked the best. The LEGO bricks wobble from side to side when placed along the round boiler, but I found that putting putty along both long edges of the LEGO didn’t improve stability. For square LEGO plates, a lump of poster putty in each corner worked well. You can also put a LEGO on the front — a four-stud round LEGO works nicely there — or the back. However, note that you can build up the front and back to the point that the magnets on your engine won’t be able to reach other train cars. 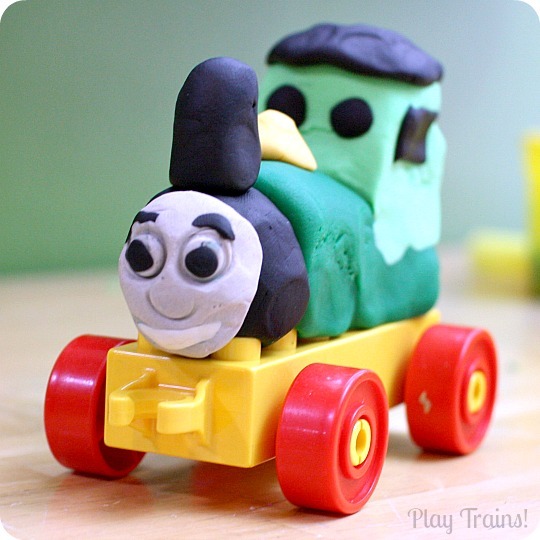 Also, when it comes to Thomas and Friends engines, I would avoid putting poster putty on the engine’s faces. I think it would be fine to do it once or twice, but I’d worry about rubbing off the paint on the faces over time. Once I’d covered the first one, the Little Engineer’s hand was drawn like a magnet to the LEGO-covered train the instant he saw it! He wanted to try covering his own train, so that’s the next thing we did. In and of itself, this made a fun design project. 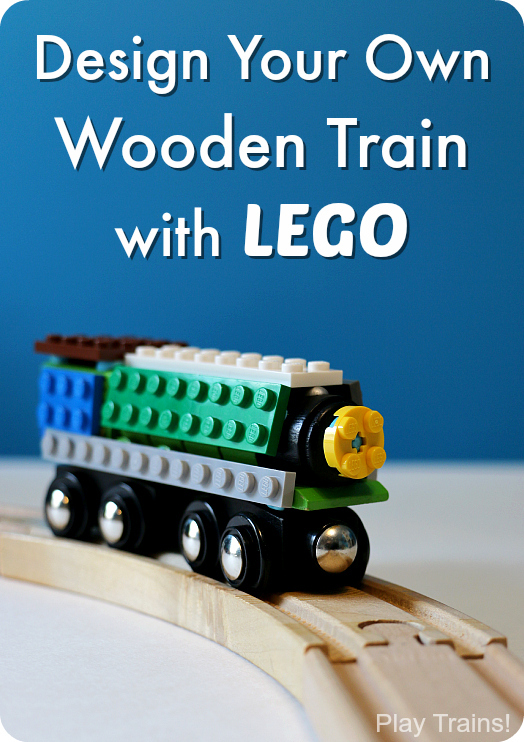 But the whole point of putting the LEGO on the wooden trains was to put more LEGO bricks on them! Time to let loose our imaginations. Other than the wobbling on the boiler, the LEGO bricks stick pretty well to the trains (until you want them to come off). 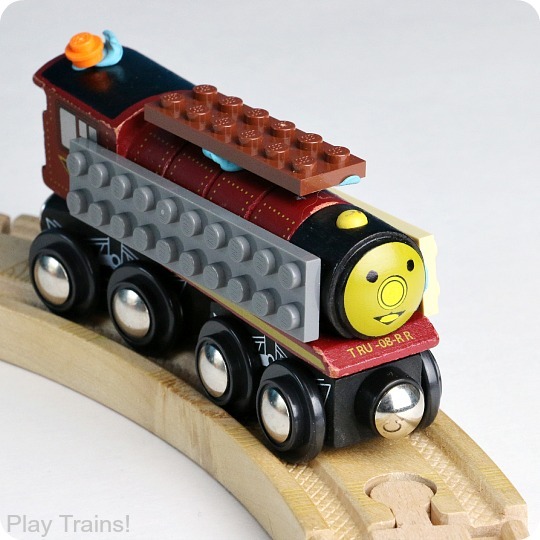 But a pinner on Pinterest had a great suggestion to use a cheap wooden train and superglue the bricks onto it. The green engine I used here is a Circo train from Target, and only cost around $3. Also, if you have any traces of poster putty left on your trains or in your LEGO bricks after removing them, they come off easily if you dab them away with a larger ball of the putty. One of the engines we collaborated on was turning wooden Rosie from Thomas and Friends into the Smoothie Express, as the Little Engineer named her. We were inspired by the LEGO Friends 41035 Heartlake Juice Bar set, which we had to have so our Star Wars minifigures could make smoothies for each other, just like we do in our own kitchen. I thought this version of the Smoothie Express was fun, but when I was busy elsewhere, the Littler Engineer made it way better. And more functional! Now, with the blenders from the juice bar set attached, Rosie can blend up two smoothies while she steams around the tracks! I didn’t get a photo of it, but the Little Engineer also went and added the citrus juicer to the wooden train he had covered with LEGO and called it the Juice Express. 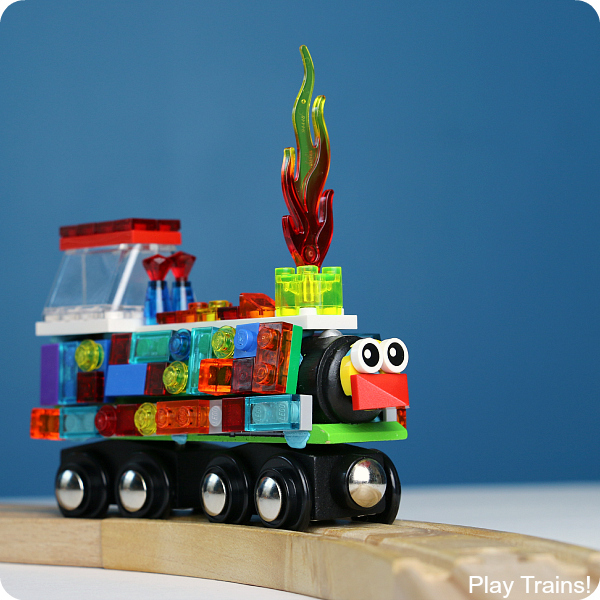 Here’s another design, created on the wooden train/LEGO base I demonstrated building above. For this one, we used a lot of small transparent LEGO tiles — we’ve gotten handfuls of them from the Pick-a-Brick wall at the LEGO store — and pieces from some of our LEGO Mixels sets, including the flame, the eyes, the yellow circle piece, and the “beak”. 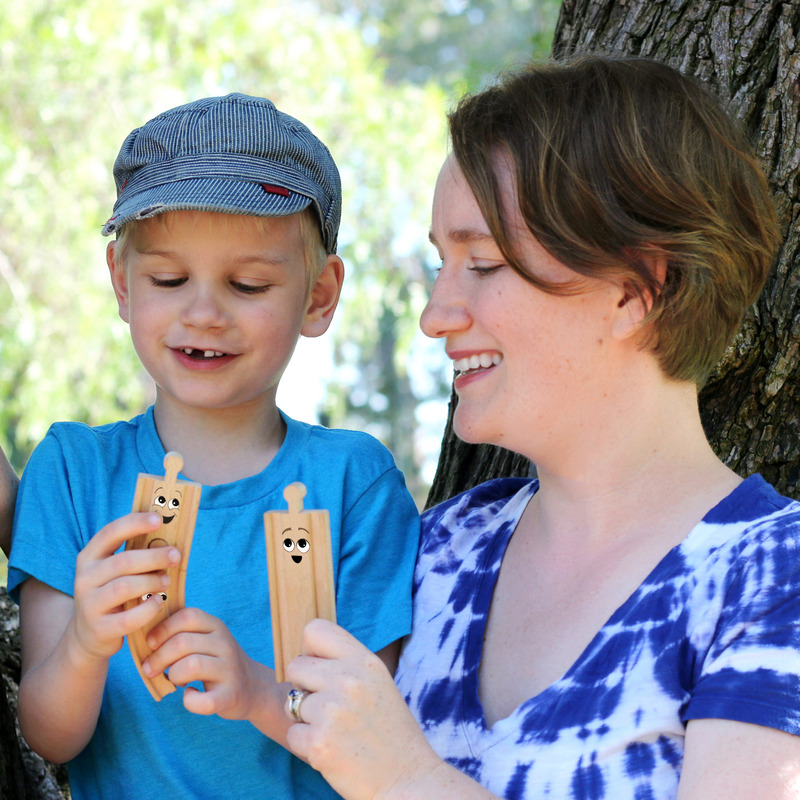 To see all the cool Mixel sets, visit the Official LEGO Online Shop! I decided it looked birdlike, and suggested we call it Fawkes after Professor Dumbledore’s phoenix due to the Little Engineer’s recent interest in Harry Potter characters. He thought it was funny, and wanted me to explain the name and what a phoenix was over and over. And then he turned into Wedge Antilles — his favorite Star Wars character — and zoomed in and knocked Fawkes down. Then Wedge nicely picked Fawkes up and repaired him. And then, Fawkes chuffed past the smoothie shop…and accidentally lit it on fire. Which was EVEN FUNNIER. I think Wedge came in and saved the day, putting out the fire on the Heartlake Smoothie Shop. We’ve since had even more adventures with more trains, but when I tried to take Fawkes apart to make something new, I was told to build him again. Most recently, he’s been seen accidentally setting fire to one of our other LEGO sets over and over…but you’ll have to come back next week to find out which one! WOW this is SO COOL! I love it! 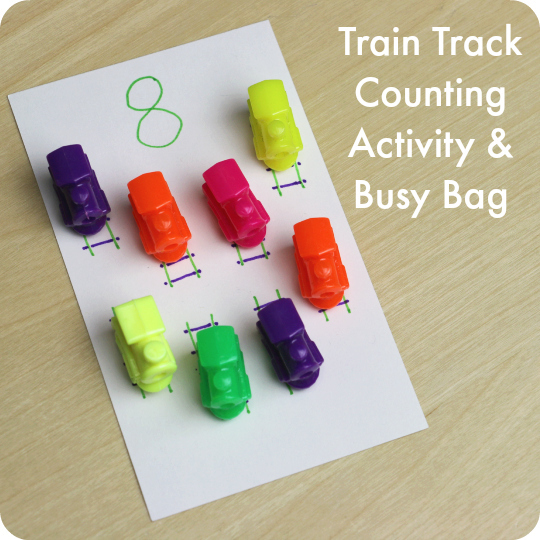 This can be a perfect activity for our birthday party countdown train. I’m sure the kids will have lots of fun with this! Thanks for the idea! Thank you so much, Angela! You’re right, this would be an excellent activity for your countdown. Great idea! I love this! So will my little Lego men! 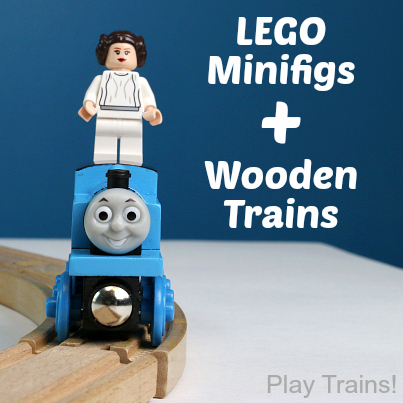 What a fun way to dd even more imagination play to trains and Legos!